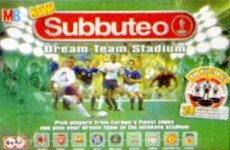 Here is the final ten years or so of Subbuteo production, plus links to the sets produced in the 21st century. This era sees official World Cup box sets, but these did not always appear in the catalogues. 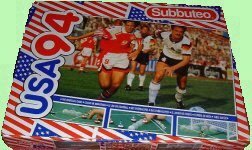 The Italia '90 catalogue showed the standard version of 60240, and the 1993 poster showed the correct USA '94 contents, but the box was just a standard one with a USA 94 sticker on it. 1990-1995 The final Waddingtons sets. The 1990s started with three re-boxed editions from the earlier range - Club, World Cup, and Grandstand. However, the sets were now designed to be sold worldwide, and so no longer had no names on the front of the box. The modular construction of the box interiors of these sets allowed "exclusive editions" at certain retailers, with an added team, or a free set of referees etc. Basically, this was the club edition with standard goals (61148) and small flags (61188). The goals usually had big red nets that don't fit too well. A floodlighting Edition featuring the new Greek pillar style floodlights. 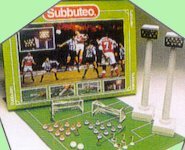 This set did not feature in a catalogue until 1995, but the new floodlights were released in 1991, and the polystyrene interior suggests that sets were produced at that time. A couple of different box lids were produced. The set illustrated here featuring Gary Lineker seems to be the earliest version. This had contents as for the World Cup 1986 set of the same number, but only had 11-a-side teams and no spare goalkeepers. It usually had two teams but sometimes had a third added, as there was room in the box. It did not have line flags, but had Tournament goals (61154), fence (61108), scoreboard (61158), and number transfers (61206). The original teams, as usual with World Cup editions are the hosts (Italy ref 415) and holders (Argentina ref 457). 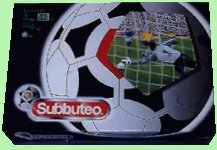 Although this was the World Cup set shown in the catalogues, there were actually a couple of alternative versions (see below). 60242 On the previous page, we saw the World Cup 1986 set being issued with a 1990 sticker on the front, but this was the first proper World Cup set for Italia 1990, with a new catalogue number to match. 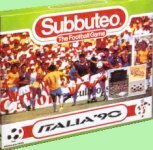 As shown bottom left in the pictures above, the box looks very similar to the 1986 version, with the same photograph, but with a large Italia '90 banner along the bottom of the lid. The insert was still the '86 one too, so it had squads of sixteen players (including spare kicking goalkeepers). However, the set also benefited from the inclusion of the proper Italia 90 balls (61220) and goals (61219). The set has been seen with Argentina (ref 457, holders), and Italy (ref 415, hosts), as the two teams, however, the set I picked up recently in the UK has Italy and England as the two teams, and indeed, these are the two teams shown in the illustration on the front of the box. 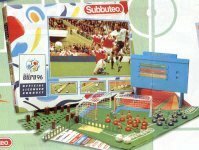 This set featured in the Italian catalogues of 1990-92 alongside the standard 60240, with the sets called "World Cup" and "Super World Cup". The teams shown here were Argentina and Italy. 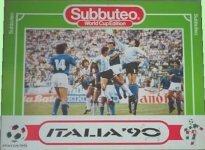 (As mentioned, the standard 1986 World Cup set was still being produced in 1989 with an Italia '90 sticker on the box, but I'm not sure whether this had the Italia 90 accessories in it). Mid way through the life of the Italia 90 range, SSG went through one of their customary box changes. All the Italia 90 accessories switched from the 1980s style of box to the 1990s versions. In line with this, further Italia 90 box sets were produced in the new box style. This gave us the standard 60240 version (mentioned above), of course, with Italy vs Argentina on the lid, but you will not be surprised to learn that there was a variation on this set too. 60243 was the official "World Cup Edition" version of the Italy vs Argentina 60240. 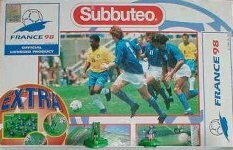 It was the same size set, but with a slightly different box (Italia '90 banner along the bottom of the lid, and "World Cup Edition" under the logo). Unlike the Super World Cup Edition, this set had standard eleven man teams in the same insert as 60240. However, like the Super set it did have the Italia 90 balls (61220) and goals (61219). The teams may well vary. Italy vs. Argentina seems logical once again, but the version I own (sold in the UK) has England vs. Italy. How confusing is this era? This is where the really interesting special sets start. The first set to break away from the usual green boxes was the USA '94 set. In principle, it was the same set as 60240, which had been introduced for the 1990 World Cup, but stayed in the range as a useful mid-ranged set. However, the key difference isn't the box. The USA 94 set uses the new USA '94 accessories - so the goals have red, white and blue nets, and the balls have the USA 94 logo. It doesn't sound much, but it makes all the difference. 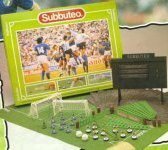 Normally, once you'd bought a Subbuteo box set, you didn't need to buy another. But this was the first set designed to attract even those who were already playing. The trick was repeated with the Euro 96 set. 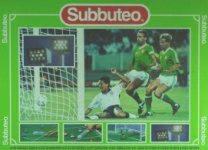 Subbuteo had only issued a set for the European Championships once before (in 1984) but the fact that this year's tournament was set in England was too good a chance to miss. Perhaps they had also been pleased with the way the USA 94 set and accessories had sold (even though England had not even qualified for that one. Boo.). The Euro '96 set was essentially the same set once again, but with the Euro 96 accessories (no really?). However, in addition, the scoreboard was a different colour for the first time (a shocking blue) and the name tags were exclusive to the tournament - with the names of teams and venues printed in several languages on colourful card. As well as their Euro 96 marketing agreement, Waddingtons also negotiated a deal with the Premier League to produce official products. This lead to a range of teams, a box of accessories, and of course, a box set. This was basically just a combination of standard club edition plus the Premiership accessory pack, and it's perhaps disappointing that the teams features were just the standard red and blue. A nice touch were the Premiership logos on the pitch, and this item was never sold separately. A Club Edition. Had a different box lid (see the Hasbro range below for an illustration), and a swap from polystyrene innards to dark green plastic, but no change to the contents. The plastic is much weaker than the polystyrene, and tends to make the sets difficult to get in and out the box. The final floodlighting edition. Only appeared on the 1995 poster, but certainly existed for longer than that. Featured the 1990s floodlights (61222). This was still in a polystyrene inner, so only the box illustration changed. Grandstand Edition. The box and set remained the same as the 1990-1992 version. (60240) A cool box for this one. Another final attempt to break the US market? Anyhow, this was similar to the Italia 90 set, except that here they use the USA 94 goals and balls. This set was actually sold with several different lids depending on which country it was sold in. See International box sets for details. Euro 96 - 60260 Like the USA set, this was 60240 territory again, but tweaked to add extra appeal using the Euro 96 balls and goals. As an extra treat, the scoreboard was blue in this set and the name tags were brightly coloured. A distinctive set. Note that the Euro 96 flags are not in this version of the set. They only appear in the Hasbro version. The teams were England (ref 719 with central badge) and a standard red/white side (sometimes ref 138, with white printed collar). The original Waddingtons Premiership Edition. Red and blue teams, tournament goals, pitch with Premiership logos, plus the contents of 61234, the Premier League accessory pack. So you got the flags, balls, referees (in green) and the Premier League Trophy. This was a short lived original version with lightweight teams. The box had the same picture as the 61234 accessory pack. The whole range makes the switch to Hasbro ownership in 1996, and the changes are immediately recognisable with the new Hasbro bases on the teams, and the self-assembly nature of the sets. The boxes no longer have lift up lids. This reduces the packaging costs, but makes the sets a pain to open, as the inner plastic is weak, and the players and accessories do not always fit too well. 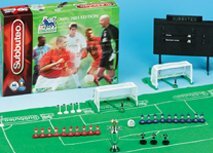 The initial Hasbro range is three sets - a Club Edition, a Euro 96 edition, and a Premiership Edition. All three set have new interiors, but only the Premiership set gets a new box illustration and a new size (it now features a scoreboard). This set had the same illustration as the final Waddingtons set, but the lid no longer lifted up. The interior was an all-in-one moulded black plastic affair. The set featured the new style Hasbro goals (the same goals they used in sets of rival game Total Action Football). The teams were on Hasbro bases. Again, the moulded plastic inner is weak and horrible, and sliding it in and out the box is a nightmare. Hasbro version of the 60270 set. This set had been enlarged by adding a scoreboard, and now had Hasbro based teams of course. Also the tournament goals were again replaced by the new goals as with the club edition. All wrapped in a large flat box, with another horrible thin black plastic interior. This was the second version of this set. I think the exterior was the same, but it had a completely different moulded interior in black. The teams were still the big badged England (ref 719) plus a standard red/white team, but now these were on Hasbro bases. Although it doesn't seem to be advertised the set also features the Euro 96 flags, which were not in the original Waddingtons set. 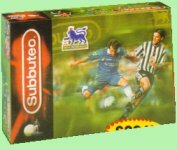 Subbuteo editions often had boxes much bigger than they needed to be. The Euro 96 and Premiership boxes were huge, but easily crushable. However from 1997, the boxes were redesigned to a more convenient size. These sets had small, deep boxes and lift off lids, making them much more sturdy. 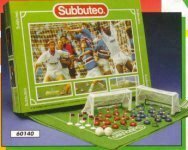 The deep boxes still had plastic insides, and these featured a large central area into which Hasbro could pack the bags of self-assembly items - players, goals, fence etc. Around the edge of this space were places to stand the teams (base down, so they took up less space). This worked quite well, and with the exception of the club edition, the boxes were deep enough to protect the goals once assembled (a problem that plagued all the self-assembly sets up to this point). I think this was the final incarnation of the club edition, and it appeared in 1997. 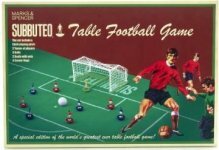 Fitted into the new compact box, the set had the final Hasbro goals (see the Man Utd illustration for details), but the line flags had been dropped from the set. The balls should be the standard green logo ones, but my set had blue Umbro Elite balls instead. More interesting in my version was the pitch, which was a cotton throw-back to the 1970s. It's thinner than a 1970s pitch and the edges are wonky, but it is a smoother surface than the usual Hasbro pitch, and an improvement. Sadly, these pitches rarely appear in any of the other sets of the era. 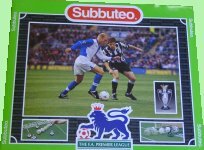 The third re-box for the Premiership set, this one had a new style of referee and lineman, but otherwise it was the same set as the big box version. This box was introduced around 1998, and this new look also featured on the last two special Boots Chocolate versions. (See the miscellaneous page ). If you are lucky, you can get a cotton pitch with Premiership logos on it in this set. See the new referees on the accessory list. This took my breath away when I first saw it (and I'm a Liverpool supporter!). All the usual stuff, but with a Man Utd feel - red fence, Man Utd logo on the pitch and balls, and just about everywhere else. Exclusive Man United rule book. Three teams, Man Utd home and away, and some poor blue suckers for them to beat. Lovely. Now, where's the Liverpool* set? 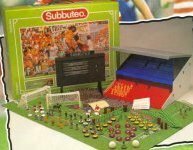 Produced at a time when Subbuteo was disappearing from toy shops in England, I didn't even see this set advertised at the time. However, with a special set for every World Cup since 1974, I'm glad this was produced. The set had three teams, which seem to differ depending on the European Country it was sold in. On the continental European version (shown above) the "extra" panel featured France. On the UK version, the box lid featured England. The other two teams to appear in the set were Italy, and holders Brazil. The other extras were a new design of corner kicker and throw-in figure, and a pair of white Tango balls. The new kicker and thrower were exclusive to this set, and like the above referees, are shown on theaccessory list. The "France" version of this set is one of the few places where white Hasbro bases appear. As both France and Italy play in blue, a different base colour was needed. They may have all but missed Christmas 2000, but the new Hasbro range did finally arrive in 2001. Available exclusively through Toys-R-Us, the hope was that these sets would get another generation of children recreating cup finals, and dreaming of one day owning a whole stadium. However, they didn't seem to be advertised and just faded away. Hopefully lots of Dads did seek them out. Again, this was an edition taken from the previous range, but it was at least updated with new Man Utd kits. I know you can't believe Man Utd would have changed kits. Mind you, the away kit in this set have strange green shirts with thin white hoops, and black shorts. Nice, but surely it should have been navy. That might make the thing collectable! The sets were originally £29.99 but were reduced to half price once it wasn't 2000/01 anymore. The most exciting part of Hasbro's re-launch was the announcement of a new Grandstand Edition. And here it is. It contains three teams (blue/white, red/white and yellow/white), the old faithful fence and scoreboard as well as the grandstand, of course. This was produced in new colours - red tiers, with white side panels and roof and also includes a cardboard sheet of supporters. Not officially released in the UK, it could be argued that this set was in fact, an international box set. It doesn't matter all that much, because it has a page all to itself anyway. Just follow the link on the above heading. The Hasbro Photo-Real Edition 2005-07. 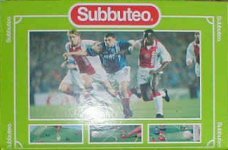 This was Hasbro's attempt to bring the game into the 21st Century, with collectable flat figures featuring real players from top European sides. Like the Parodi edition, this set has its own page, showing more details. There were actually two versions of the set. The original "new" version is shown above. The second edition removed the word "new" from the lid, and coincided with the second season of player cards. That meant that the badges of the two extra teams (Roma and Benfica) were added to the box lid, and the new set of cards were the ones included in the box. A lovely retro-designed release, this was essentially a standard lightweight club edition in a fancy box. It was a little more complicated than that though, and is another set with its own page. Just follow the heading link once more. That brings you up to date with the editions. You can now visit the international box sets, the five-a-side page, or look at something else.